Wound healing, or cicatrisation, is an intricate process in which the skin (or another organ-tissue) repairs itself after injury. In normal skin, the epidermis (outermost layer) and dermis (inner or deeper layer) exists in a steady-state equilibrium, forming a protective barrier against the external environment. Once the protective barrier is broken, the normal (physiologic) process of wound healing is immediately set in motion. The classic model of wound healing is divided into three or four sequential, yet overlapping, phases: (1) hemostasis (not considered a phase by some authors), (2) inflammatory, (3) proliferative and (4) remodeling. Upon injury to the skin, a set of complex biochemical events takes place in a closely orchestrated cascade to repair the damage. Within minutes post-injury, platelets (thrombocytes) aggregate at the injury site to form a fibrin clot. This clot acts to control active bleeding (hemostasis). In the inflammatory phase, bacteria and debris are phagocytosed and removed, and factors are released that cause the migration and division of cells involved in the proliferative phase. The early phase, which begins immediately following skin injury, involves cascading molecular and cellular events leading to hemostasis and formation of an early, makeshift extracellular matrix—providing structural support for cellular attachment and subsequent cellular proliferation. The cellular phase follows the early phase, and involves several types of cells working together to mount an inflammatory response, synthesize granulation tissue, and restore the epithelial layer. Subdivisions of the cellular phase are:  Macrophages and inflammatory components (within 1–2 days),  Epithelial-mesenchymal interaction: re-epithelialization (phenotype change within hours, migration begins on day 1 or 2,  Fibroblasts and myofibroblasts: progressive alignment, collagen production, and matrix contraction (between day 4 day 14),  Endothelial cells and angiogenesis (begins on day 4),  Dermal matrix: elements of fabrication (begins on day 4, lasting 2 weeks) and alteration/remodeling (begins after week 2, lasting weeks to months—depending on wound size.). Just before the inflammatory phase is initiated, the clotting cascade takes place in order to obtain hemostasis, or stop blood loss by way of a fibrin clot. Thereafter, various soluble factors (including chemokines and cytokines) are released to attract cells that phagocytise debris, bacteria, and damaged tissue, in addition to releasing signaling molecules that initiate the proliferative phase of wound healing. When tissue is first wounded, blood comes in contact with collagen, triggering blood platelets to begin secreting inflammatory factors. Platelets also express glycoproteins on their cell membranes that allow them to stick to one another and to aggregate, forming a mass. Platelets, the cells present in the highest numbers shortly after a wound occurs, release a number of things into the blood, including ECM proteins and cytokines, including growth factors. Growth factors stimulate cells to speed their rate of division. Platelets also release other proinflammatory factors like serotonin, bradykinin, prostaglandins, prostacyclins, thromboxane, and histamine, which serve a number of purposes, including to increase cell proliferation and migration to the area and to cause blood vessels to become dilated and porous. Immediately after a blood vessel is breached, ruptured cell membranes release inflammatory factors like thromboxanes and prostaglandins that cause the vessel to spasm to prevent blood loss and to collect inflammatory cells and factors in the area. This vasoconstriction lasts five to ten minutes and is followed by vasodilation, a widening of blood vessels, which peaks at about 20 minutes post-wounding. Vasodilation is the result of factors released by platelets and other cells. The main factor involved in causing vasodilation is histamine. Histamine also causes blood vessels to become porous, allowing the tissue to become edematous because proteins from the bloodstream leak into the extravascular space, which increases its osmolar load and draws water into the area. Increased porosity of blood vessels also facilitates the entry of inflammatory cells like leukocytes into the wound site from the bloodstream. Macrophages are essential to wound healing. They replace PMNs as the predominant cells in the wound by two days after injury. Attracted to the wound site by growth factors released by platelets and other cells, monocytes from the bloodstream enter the area through blood vessel walls. Numbers of monocytes in the wound peak one to one and a half days after the injury occurs. Once they are in the wound site, monocytes mature into macrophages. The spleen contains half the body's monocytes in reserve ready to be deployed to injured tissue. The macrophage's main role is to phagocytize bacteria and damaged tissue, and they also debride damaged tissue by releasing proteases. Macrophages also secrete a number of factors such as growth factors and other cytokines, especially during the third and fourth post-wounding days. These factors attract cells involved in the proliferation stage of healing to the area., although they may restrain the contraction phase. Macrophages are stimulated by the low oxygen content of their surroundings to produce factors that induce and speed angiogenesis. and they also stimulate cells that reepithelialize the wound, create granulation tissue, and lay down a new extracellular matrix. By secreting these factors, macrophages contribute to pushing the wound healing process into the next phase. Type III collagen and fibronectin are generally beginning to be produced in appreciable amounts at somewhere between approximately 10 hours and 3 days, depending mainly on wound size. Their deposition peaks at one to three weeks. They are the predominating tensile substances until the later phase of maturation, in which they are replaced by the stronger type I collagen. Contraction is a key phase of wound healing. If contraction continues for too long, it can lead to disfigurement and loss of function. Thus there is a great interest in understanding the biology of wound contraction, which can be modelled in vitro using the collagen gel contraction assay or the dermal equivalent model. Contraction commences approximately a week after wounding, when fibroblasts have differentiated into myofibroblasts  In full thickness wounds, contraction peaks at 5 to 15 days post wounding. Contraction can last for several weeks and continues even after the wound is completely reepithelialized. A large wound can become 40 to 80% smaller after contraction. Wounds can contract at a speed of up to 0.75 mm per day, depending on how loose the tissue in the wounded area is. Contraction usually does not occur symmetrically; rather most wounds have an 'axis of contraction' which allows for greater organization and alignment of cells with collagen. When the levels of collagen production and degradation equalize, the maturation phase of tissue repair is said to have begun. During maturation, type III collagen, which is prevalent during proliferation, is gradually degraded and the stronger type I collagen is laid down in its place. Originally disorganized collagen fibers are rearranged, cross-linked, and aligned along tension lines. The onset of the maturation phase may vary extensively, depending on the size of the wound and whether it was initially closed or left open, ranging from approximately 3 days to 3 weeks The maturation phase can last for a year or longer, similarly depending on wound type. Up until a decade ago, the classic paradigm of wound healing, involving stem cells restricted to organ-specific lineages, had never been seriously challenged. Since then, the notion of adult stem cells having cellular plasticity or the ability to differentiate into non-lineage cells has emerged as an alternative explanation. To be more specific, hematopoietic progenitor cells (that give rise to mature cells in the blood) may have the ability de-differentiate back into hematopoietic stem cells and/or transdifferentiate into non-lineage cells, such as fibroblasts. Examples: gingivectomy, gingivoplasty, tooth extraction sockets, poorly reduced fractures. ^ a b c d e f g h i j k l m Stadelmann, WK; Digenis, AG; Tobin, GR (1998). "Physiology and healing dynamics of chronic cutaneous wounds". American journal of surgery 176 (2A Suppl): 26S–38S. doi:10.1016/S0002-9610(98)00183-4. PMID 9777970. ^ a b c d e f g h Midwood, K.S. ; Williams, L.V. ; Schwarzbauer, J.E. (2004). "Tissue repair and the dynamics of the extracellular matrix". The International Journal of Biochemistry & Cell Biology 36 (6): 1031–1037. doi:10.1016/j.biocel.2003.12.003. PMID 15094118. ^ Chang, HY; Sneddon, JB; Alizadeh, AA; Sood, R; West, RB; Montgomery, K; Chi, JT; Van De Rijn, M et al. (2004). "Gene expression signature of fibroblast serum response predicts human cancer progression: similarities between tumors and wounds". PLoS biology 2 (2): E7. doi:10.1371/journal.pbio.0020007. PMC 314300. PMID 14737219. http://biology.plosjournals.org/perlserv/?request=get-document&doi=10.1371/journal.pbio.0020007. ^ Sandeman, S.R. ; Allen, M.C. ; Liu, C.; Faragher, R.G.A. ; Lloyd, A.W. (2000). "Human keratocyte migration into collagen gels declines with in vitro ageing". Mechanisms of Ageing and Development 119 (3): 149–157. doi:10.1016/S0047-6374(00)00177-9. PMID 11080534. ^ Theoret, C.L. (2004). "Update on wound repair". Clinical Techniques in Equine Practice 3 (2): 110–122. doi:10.1053/j.ctep.2004.08.009. ^ a b c d e f g h Greenhalgh, D.G. (1998). "The role of apoptosis in wound healing". The International Journal of Biochemistry & Cell Biology 30 (9): 1019–1030. doi:10.1016/S1357-2725(98)00058-2. PMID 9785465. ^ Muller, M.J.; Hollyoak, M.A. ; Moaveni, Z.; La, T.; Brown, H.; Herndon, D.N. ; Heggers, J.P. (2003). "Retardation of wound healing by silver sulfadiazine is reversed by Aloe vera and nystatin". Burns 29 (8): 834–836. doi:10.1016/S0305-4179(03)00198-0. PMID 14636760. ^ Martin, P.; Leibovich, SJ (2005). "Inflammatory cells during wound repair: the good, the bad and the ugly". Trends in Cell Biology 15 (11): 599–607. doi:10.1016/j.tcb.2005.09.002. PMID 16202600. ^ a b c d e f g h Santoro, M.M. ; Gaudino, G. (2005). "Cellular and molecular facets of keratinocyte reepithelization during wound healing". Experimental Cell Research 304 (1): 274–286. doi:10.1016/j.yexcr.2004.10.033. PMID 15707592. ^ Swirski, F. K.; Nahrendorf, M.; Etzrodt, M.; Wildgruber, M.; Cortez-Retamozo, V.; Panizzi, P.; Figueiredo, J.-L.; Kohler, R. H. et al. (2009). "Identification of Splenic Reservoir Monocytes and Their Deployment to Inflammatory Sites". Science 325 (5940): 612–616. doi:10.1126/science.1175202. PMC 2803111. PMID 19644120. http://www.pubmedcentral.nih.gov/articlerender.fcgi?tool=pmcentrez&artid=2803111. ^ Jia, T.; Pamer, E. G. (2009). "Dispensable But Not Irrelevant". Science 325 (5940): 549–550. doi:10.1126/science.1178329. PMC 2917045. PMID 19644100. http://www.pubmedcentral.nih.gov/articlerender.fcgi?tool=pmcentrez&artid=2917045. ^ a b c d e f Deodhar, AK; Rana, RE (4/1/1997). "Surgical physiology of wound healing: a review". Journal of Postgraduate Medicine 43 (2): 52. PMID 10740722. http://www.jpgmonline.com/article.asp?issn=0022-3859;year=1997;volume=43;issue=2;spage=52;epage=6;aulast=Deodhar. ^ a b c Newton, P. M.; Watson, J. A.; Wolowacz, R. G.; Wood, E. J. (2004). "Macrophages Restrain Contraction of an In Vitro Wound Healing Model". Inflammation 28 (4): 207. doi:10.1023/B:IFLA.0000049045.41784.59. PMID 15673162. http://www.springerlink.com/content/g518380278431706/. ^ a b c d e f g h Mercandetti M., Cohen A.J. (2005). Wound Healing: Healing and Repair. Emedicine.com. Accessed January 20, 2008. ^ Stashak, T.S. ; Farstvedt, E.; Othic, A. (2004). "Update on wound dressings: Indications and best use". Clinical Techniques in Equine Practice 3 (2): 148–163. doi:10.1053/j.ctep.2004.08.006. ^ Lansdown, A.B.G. ; Sampson, B.; Rowe, A. (2001). "Experimental observations in the rat on the influence of cadmium on skin wound repair". International Journal of Experimental Pathology 82 (1): 35–41. doi:10.1046/j.1365-2613.2001.00180.x. PMID 11422539. ^ a b c d Song, G; Nguyen, DT; Pietramaggiori, G; Scherer, S; Chen, B; Zhan, Q; Ogawa, R; Yannas, IV et al. (2010). "Use of the parabiotic model in studies of cutaneous wound healing to define the participation of circulating cells". Wound repair and regeneration : official publication of the Wound Healing Society [and] the European Tissue Repair Society 18 (4): 426–432. doi:10.1111/j.1524-475X.2010.00595.x. PMC 2935287. PMID 20546556. http://www.pubmedcentral.nih.gov/articlerender.fcgi?tool=pmcentrez&artid=2935287. ^ Ruszczak, Z. (2003). "Effect of collagen matrices on dermal wound healing". Advanced Drug Delivery Reviews 55 (12): 1595–1611. doi:10.1016/j.addr.2003.08.003. PMID 14623403. ^ a b Fig. 9-1. The cellular, biochemical, and mechanical phases of wound healing. Pollock, Raphael E.; F. Charles Brunicardi; Dana K. Andersen; Billiar, Timothy R.; Dunn, David; Hunter, John G.; Matthews, Jeffrey J. (2009). Schwartz's Principles of Surgery, Ninth Edition. McGraw-Hill Professional. ISBN 0-07-154769-X. ^ a b c d Bartkova, J.; Grøn, B.; Dabelsteen, E.; Bartek, J. (2003). "Cell-cycle regulatory proteins in human wound healing". Archives of Oral Biology 48 (2): 125–132. doi:10.1016/S0003-9969(02)00202-9. PMID 12642231. ^ Witte, M.B. ; Barbul, A. (2002). "Role of nitric oxide in wound repair". The American Journal of Surgery 183 (4): 406–412. doi:10.1016/S0002-9610(02)00815-2. PMID 11975928. ^ Son, H.J. Bae H.C.; Kim, H.J. ; Lee, D.H.; Han, D.W.; Park, J.C.; Park, J (2005). "Effects of β-glucan on proliferation and migration of fibroblasts". Current Applied Physics 5 (5): 468–471. doi:10.1016/j.cap.2005.01.011. ^ Falanga, V. (2004). "The chronic wound: impaired healing and solutions in the context of wound bed preparation". Blood Cells, Molecules, and Diseases 32 (1): 88–94. doi:10.1016/j.bcmd.2003.09.020. PMID 14757419. ^ Etscheid, M.; Beer, N.; Dodt, J. (2005). "The hyaluronan-binding protease upregulates ERK1/2 and PI3K/Akt signalling pathways in fibroblasts and stimulates cell proliferation and migration". Cellular Signalling 17 (12): 1486–1494. doi:10.1016/j.cellsig.2005.03.007. PMID 16153533. ^ Bayram, Y; Deveci, M; Imirzalioglu, N; Soysal, Y; Sengezer, M (2005). "The cell based dressing with living allogenic keratinocytes in the treatment of foot ulcers: a case study". British journal of plastic surgery 58 (7): 988–96. doi:10.1016/j.bjps.2005.04.031. PMID 16040019. ^ Sørensen, OE; Thapa, DR; Roupé, KM; Valore, EV; Sjöbring, U; Roberts, AA; Schmidtchen, A; Ganz, T (2006). "Injury-induced innate immune response in human skin mediated by transactivation of the epidermal growth factor receptor". The Journal of clinical investigation 116 (7): 1878–85. doi:10.1172/JCI28422. PMC 1479426. PMID 16778986. http://www.pubmedcentral.nih.gov/articlerender.fcgi?tool=pmcentrez&artid=1479426. ^ a b c d Hinz, B (2006). "Masters and servants of the force: the role of matrix adhesions in myofibroblast force perception and transmission". European journal of cell biology 85 (3–4): 175–81. doi:10.1016/j.ejcb.2005.09.004. PMID 16546559. ^ Grinnell, F. (1994). "Fibroblasts, myofibroblasts, and wound contraction". J. Cell Biol 124 (4): 401–404. doi:10.1083/jcb.124.4.401. PMC 2119916. PMID 8106541. http://www.pubmedcentral.nih.gov/articlerender.fcgi?tool=pmcentrez&artid=2119916. ^ a b Eichler, MJ; Carlson, MA (2006). "Modeling dermal granulation tissue with the linear fibroblast-populated collagen matrix: a comparison with the round matrix model". Journal of dermatological science 41 (2): 97–108. doi:10.1016/j.jdermsci.2005.09.002. PMID 16226016. ^ a b c d Mirastschijski, U.; Haaksma, C.J. ; Tomasek, J.J.; Ågren, M.S. (2004). "Matrix metalloproteinase inhibitor GM 6001 attenuates keratinocyte migration, contraction and myofibroblast formation in skin wounds". Experimental Cell Research 299 (2): 465–475. doi:10.1016/j.yexcr.2004.06.007. PMID 15350544. 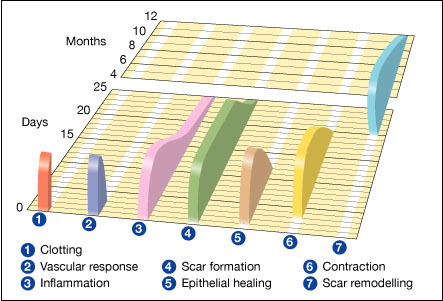 ^ worldwidewounds.com > Figure 3 - The time relationship between the different processes of wound healing. by Gregory S Schultz, Glenn Ladwig and Annette Wysocki - in turn adapted from Asmussen PD, Sollner B. Mechanism of wound healing. In: Wound Care. Tutorial Medical Series. Stuttgart: Hippokrates Verlag, 1993. ^ O'Leary, R; Wood, EJ; Guillou, PJ (2002). "Pathological scarring: strategic interventions". The European journal of surgery = Acta chirurgica 168 (10): 523–34. PMID 12666691. ^ Desmouliere, A.; Chaponnier, C.; Gabbiani, G. (2005). "Tissue repair, contraction, and the myofibroblast". Wound Repair and Regeneration 3 (1): 7–12. doi:10.1111/j.1067-1927.2005.130102.x. PMID 15659031. ^ Yannas, I. V.; Lee, E; Orgill, DP; Skrabut, EM; Murphy, GF (1989). "Synthesis and Characterization of a Model Extracellular Matrix that Induces Partial Regeneration of Adult Mammalian Skin" (PDF). Proceedings of the National Academy of Sciences 86 (3): 933–937. doi:10.1073/pnas.86.3.933. PMC 286593. PMID 2915988. http://www.pnas.org/content/86/3/933.full.pdf. ^ O'Leary, R; Ponnambalam, S; Wood, EJ (2003). "Pioglitazone-induced myofibroblast cell death: implications for cutaneous scarring.". The British Journal of Dermatology 149 (3): 665–7. PMID 14511015. ^ Tong et al, Stimulated neovascularization, inflammation resolution and collagen maturation in healing rat cutaneous wounds by a heparan sulfate glycosaminoglycan mimetic, OTR4120. Wound Repair Regen. 2009 Nov-Dec;17(6):840-52. ^ Barritault et al, Regenerating agents (RGTAs): a new therapeutic approach. Ann Pharm Fr. 2006 Mar;64(2):135-44. Orgill D.P. Wound Healing and Tissue Engineering Laboratory Harvard Medical School, Brigham & Women's Hospital.